Howard Phillips Lovecraft may not have created the horror story, but his work in the genre remains vibrant and compelling to new generations of readers, spawning an entire mythos unto itself. Many of his stories were written some years before Lovecraft found a home for them in Weird Tales magazine, which was faltering at the time they printed Dagon, his first contribution to the pulp. In his letters he mentioned that he almost gave up sending stories when they insisted he re-do them by typewriter, a labor he despised. While HPL was also known to have collaborated anonymously with other authors, we have included only stories which are credited to him; the exception being several installments in 1924 recounting supposed adventures of the famous magician and escape artist Harry Houdini. HPL’s private letters confirm that he wrote the tales completely himself, based loosely on a verbal (and presumably fictitious) account Houdini gave Weird Tales founder JC Henneberger. ‘The Survivor’, printed in Weird Tales in July 1954 and written by August Derleth and HPL is considered by many to be a Derleth story with only minimal conceptual input from a Lovecraft fragment, and has therefore been excluded from [these volumes]. This is . 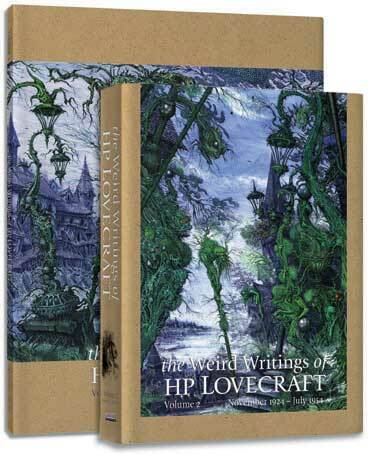 . . a 2 volume set collecting all of HP Lovecraft’s writings from the original run of Weird Tales, stories, verse and letters to the editor. The works are presented chronologically by original publication date, aside from one or two alterations strictly for convenient page fitting. [The first] volume contains HPL’s material from oversized ‘bedsheet’ issues only. The contents pages list the story/verse title, the page(s) it appeared in the original pulp magazine, and the page it begins in [these volumes]. The content presented here is in facsimile form, scanned directly from the original pulp pages including all accompanying illustrations. No editing or resetting of the type has been done so as to preserve the true flavor of the period while distilling the HPL material. Print production was a varying commodity in the pulps, and we are at the mercy of decades-old technology coupled with the cheap, porous pulp paper. The oversized issues were especially guilty of poor production quality, with ink horded more strenuously than gold, making decent reproduction nearly impossible. These problems create many challenges for this kind of collection. Considerable cleanup has been done to the electronic files and multiple copies of the magazine were often sourced to improve the starting point. Weird Tales underwent several size and format changes over the years; the 1923 and ’24 issues with HPL (except for November 1924) were the oversized ‘bedsheet’ format. The mid to late 1920s and ’30s issues vary in size also, ’though they are closer to the ‘standard’ 7"x10" pulp size. The magazine eventually went to a digest in the 1950s shortly before its demise. We have retained the variations in size, again to preserve the content true to its original printing. The Weird Writings of HP Lovecraft. By H.P. Lovecraft, With an Introduction by Neil & Leigh Mechem. Mississauga, ON: Girasol Collectables Inc.; 2010; hardbacks; 58 and 574 pages. This book may be purchased from the publisher, Girasol Collectables.